The present study describes production and recovery of poly(3-hydroxybutyrate) P(3HB) from agro-industrial residues. Production was conducted using Ralstonia eutropha strain with hemp hurd biomass hydrolysates sugars as a carbon source and ammonium chloride as the nitrogen source. Results show that maximum hydrolysis yield of 72.4% was achieved with total sugar hydrolysate concentration (i.e., glucose and xylose) of 53.0 g/L. Sugar metabolism by R. eutropha showed preference for glucose metabolism over xylose. Under optimum conditions, cells can accumulate P(3HB) polymer in quantity up to 56.3 wt% of the dry cell weight. This corresponds to total production of 13.4 g/L (productivity of 0.167 g/L h). Nitrogen source showed no adverse effect on P(3HB) biosynthesis, but rather on cell growth. 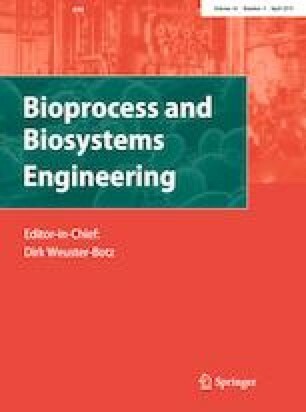 Among several examined recovery techniques, ultrasonic-assisted sodium dodecyl sulfate (SDS) recovered bioplastic directly from the broth cell concentrate with P(3HB) content of 92%. Number average molecular weights (Mn) of final recovered bioplastic were in the range of 150–270 kDa with polydispersity index (Mw/Mn) in the range of 2.1–2.4. Authors would like to acknowledge financial support from Shepherdess Biotech Inc. (Canada), the Natural Sciences and Engineering Research Council of Canada (NSERC), and the Faculty of Engineering and Architectural Science at Ryerson University in Toronto, Canada. Furthermore, financial and technical support of Shepherdess Ecotech (Toronto, Canada) is highly appreciated.